What is this thing for? I have a Waste Master system but I don't see what this does. 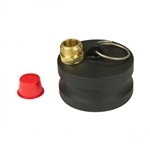 This garden hose adapter attaches to the RV side and can be used to rinse out the tank or it can also be used to run gray water out.